Called Au Bapteme by French voyageurs, the North Shore’s Baptism River drops 700 feet before reaching Lake Superior, making it home to several waterfalls. The most spectacular of these is High Falls, a 70-foot drop—second only to the Pigeon River’s 120-foot High Falls in all of Minnesota—located a mile or so from the entry to Tettegouche State Park. The river also contains Two-Step Falls, found downstream from High Falls. Though not as tall, Two-Step spills over some spectacular rock formations. Ilgen Falls (sometimes spelled “Illgin Falls” and “Elgin Falls”) is found upriver from High Falls and drops the river 35 feet where it roils into a cauldron on its way downstream. It takes its name from nearby Ilgen City, established in 1924 by Rudolph Ilgen and his family, who moved from Des Moines, Iowa, bought some land from 3M, and set up a sawmill, store, hotel, and cabins. 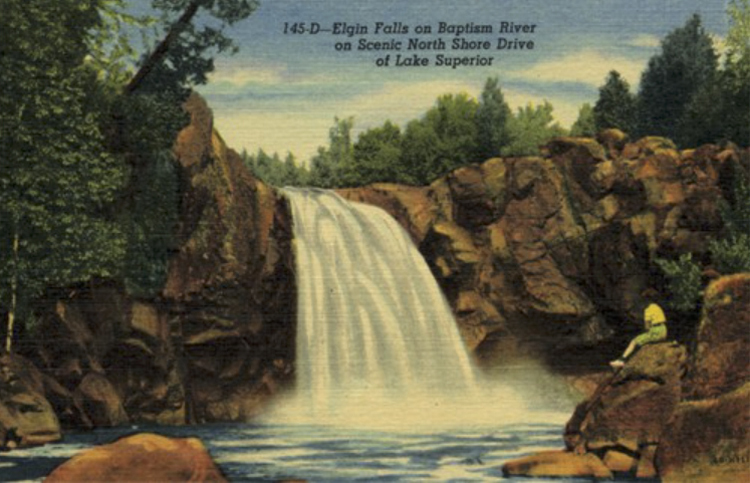 In 1910 the Alger-Smith Lumber Company sold its logged-out land surrounding the Baptism to the “Tettegouche Club,” a group of Duluth businessmen, for use as a fishing retreat. The property was later sold to the deLaittres family, who acted as its stewards until the land became a state park in 1979. The park also adopted Baptism River State Park, which had been created in 1945.